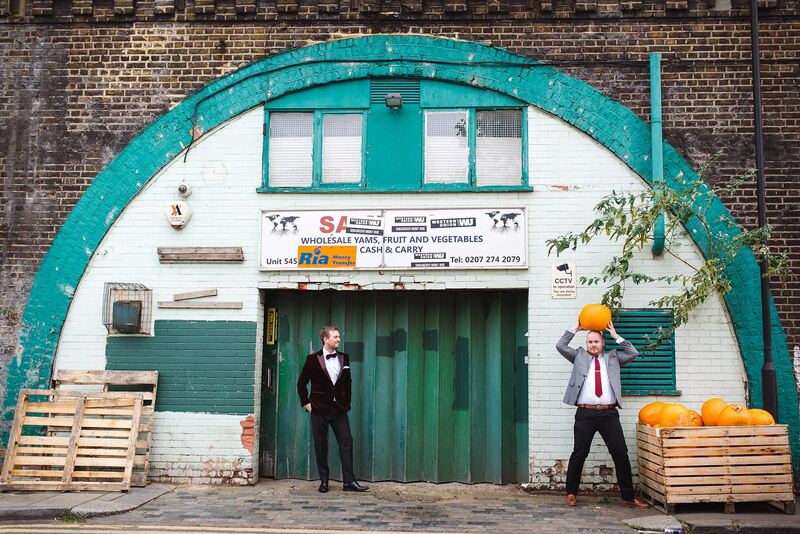 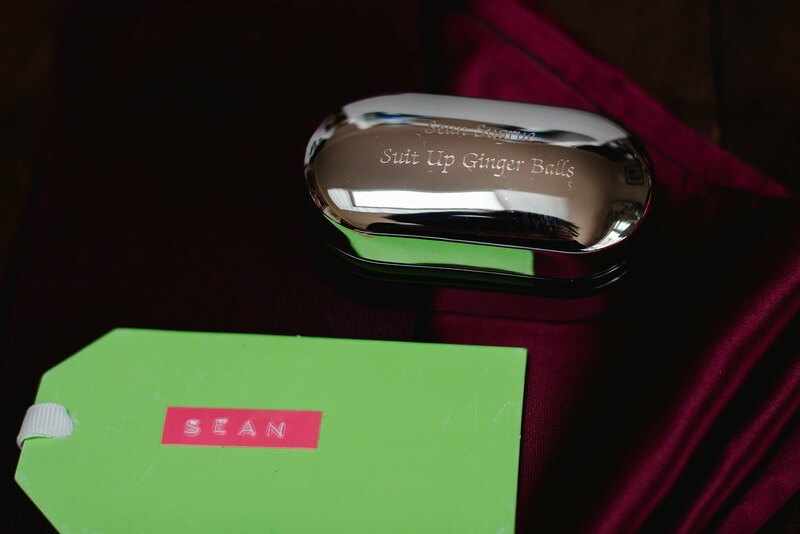 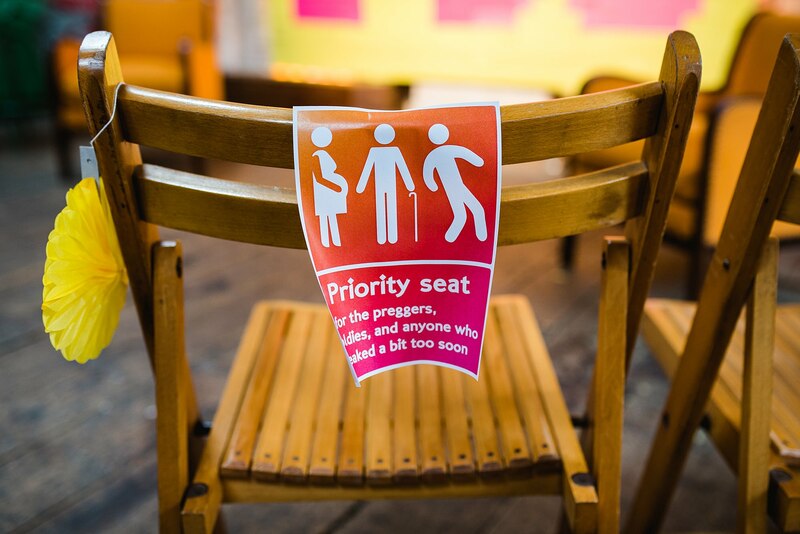 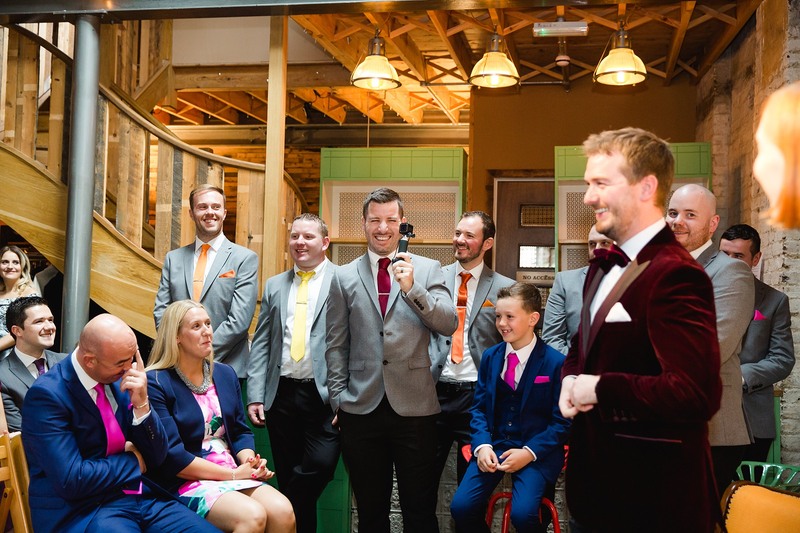 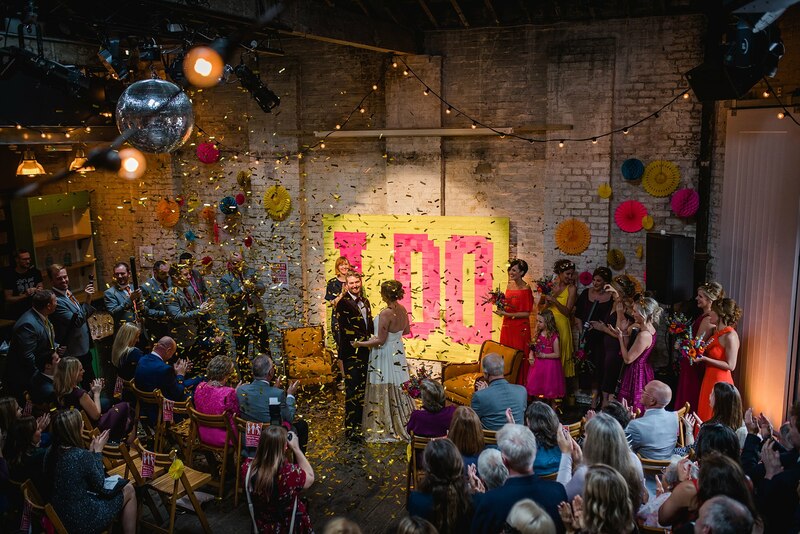 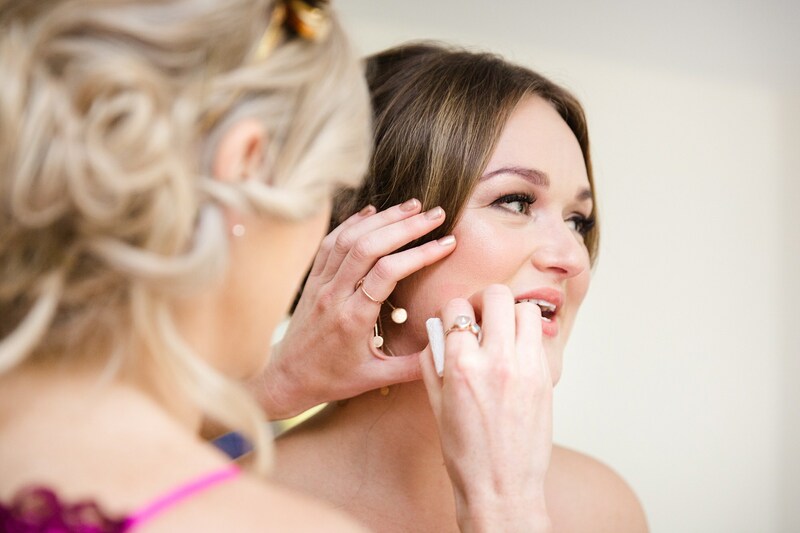 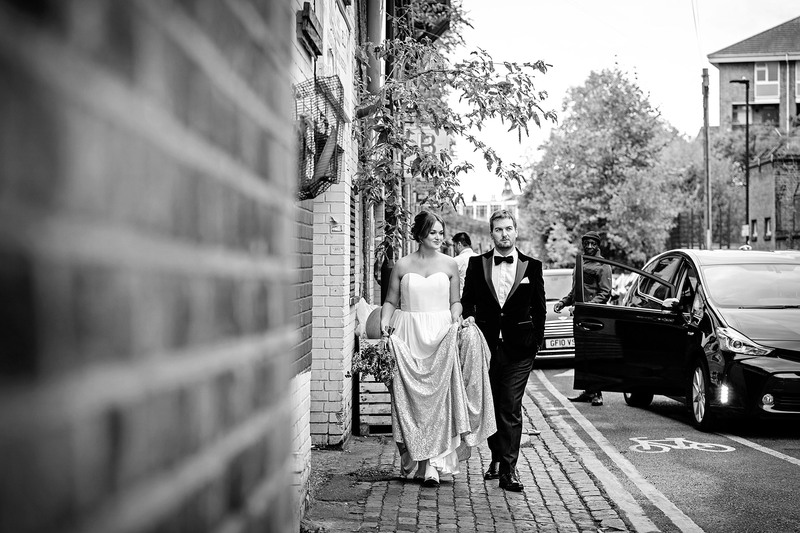 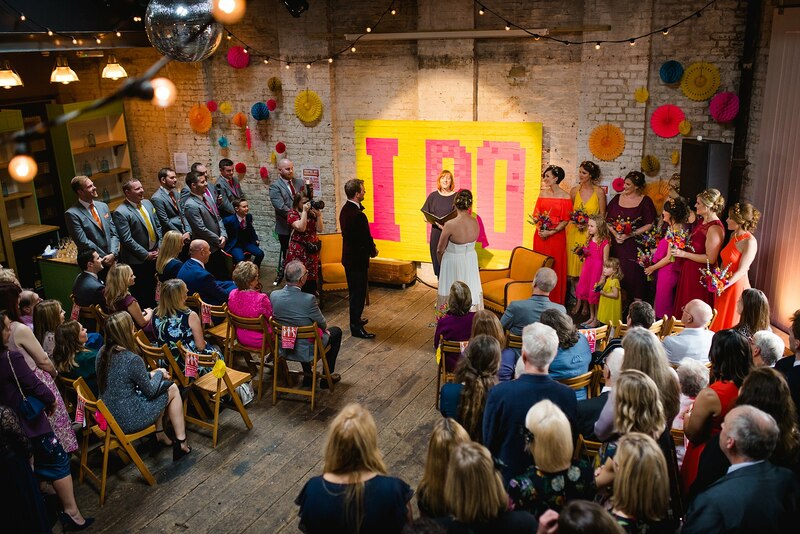 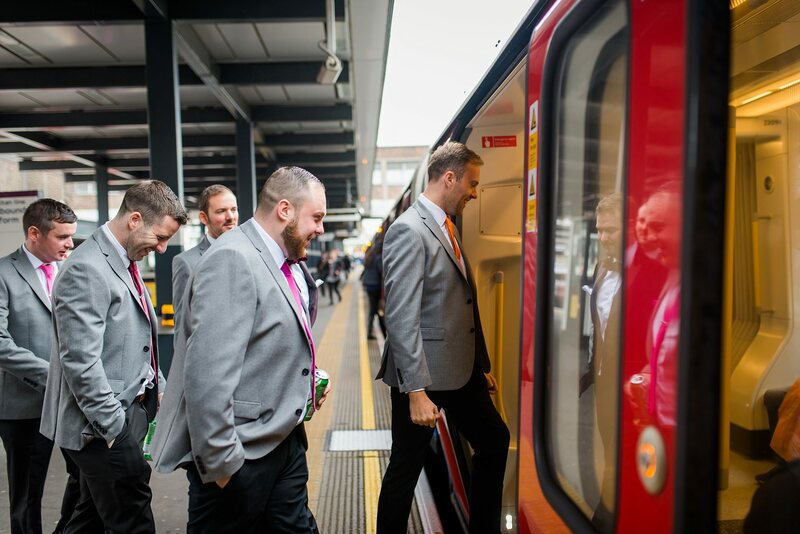 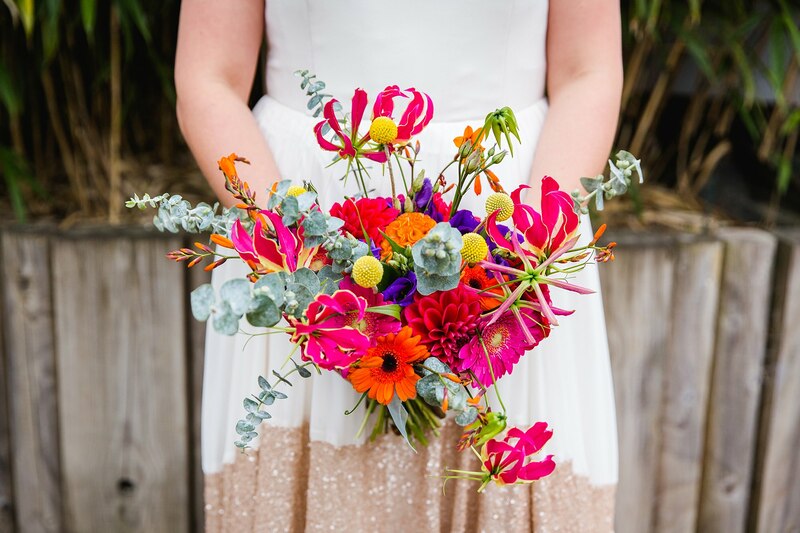 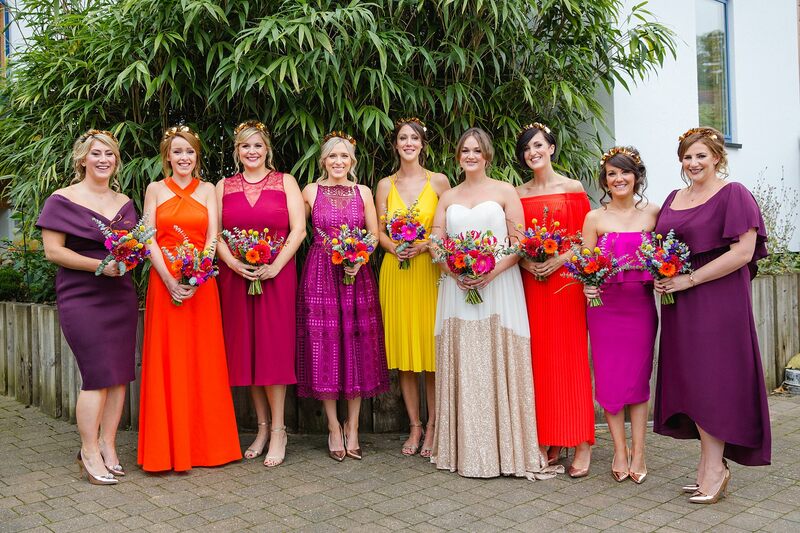 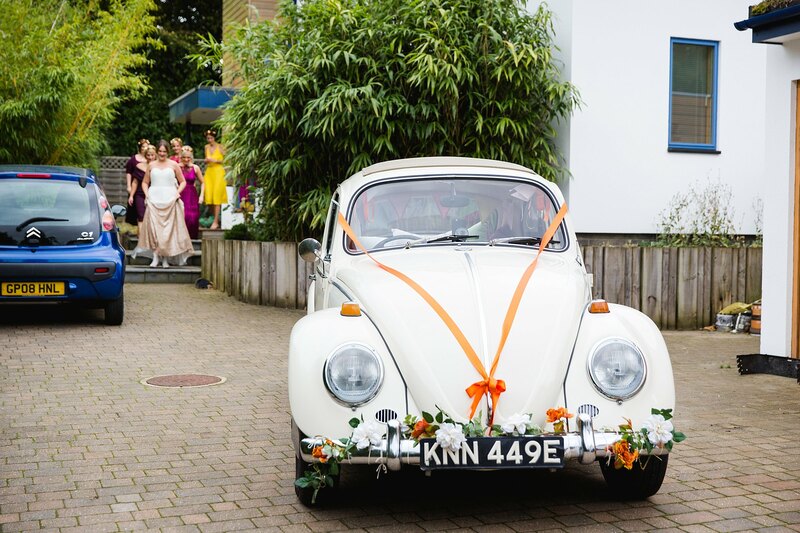 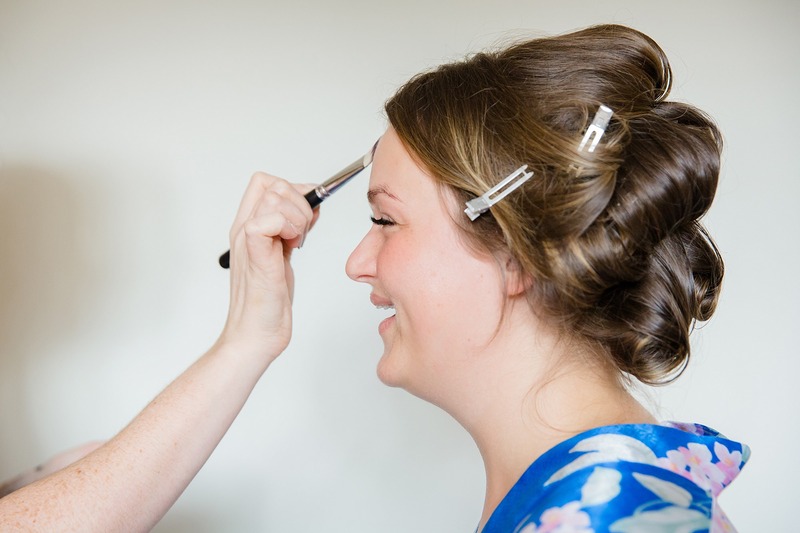 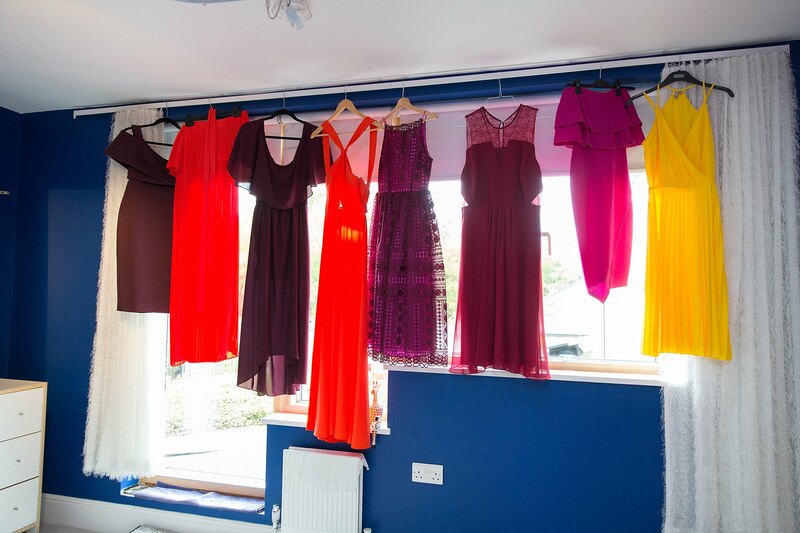 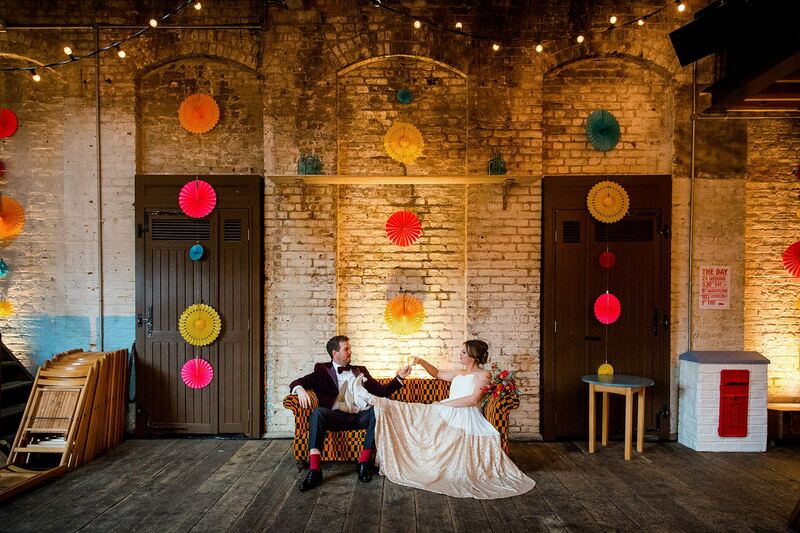 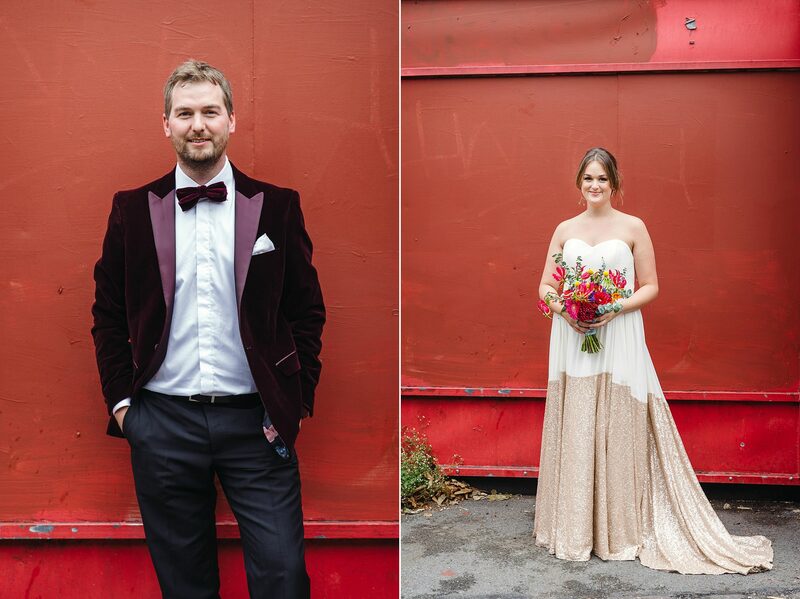 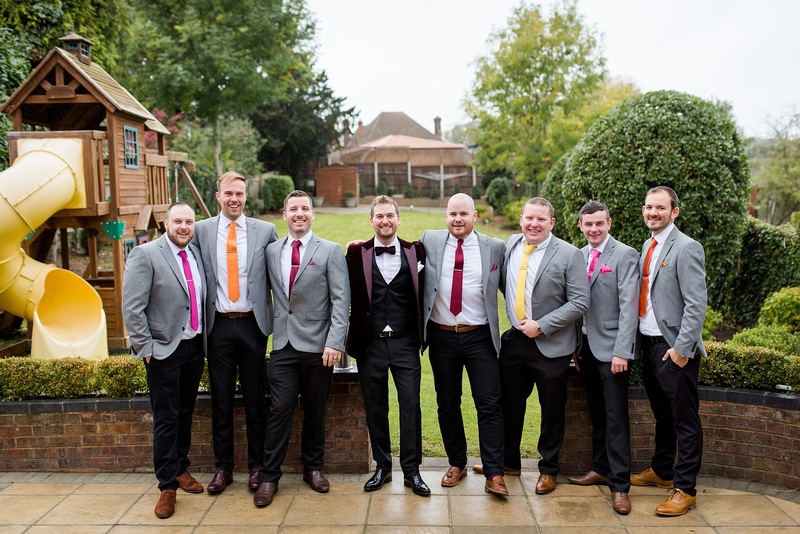 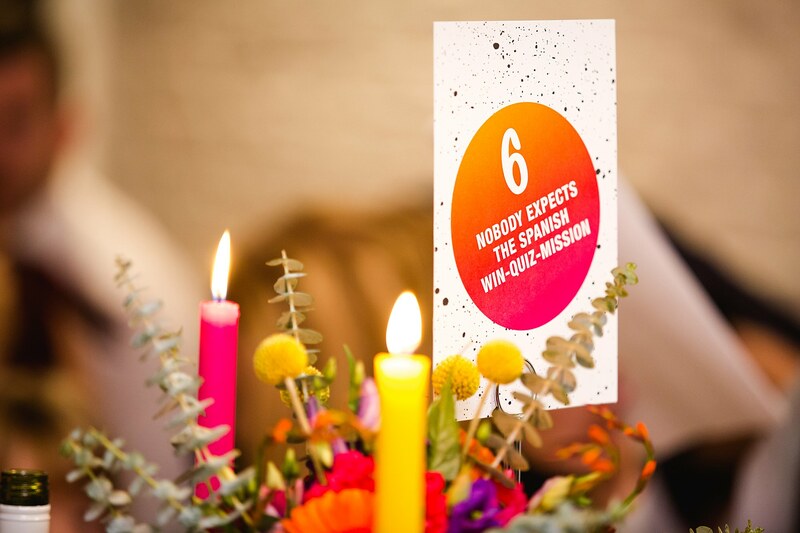 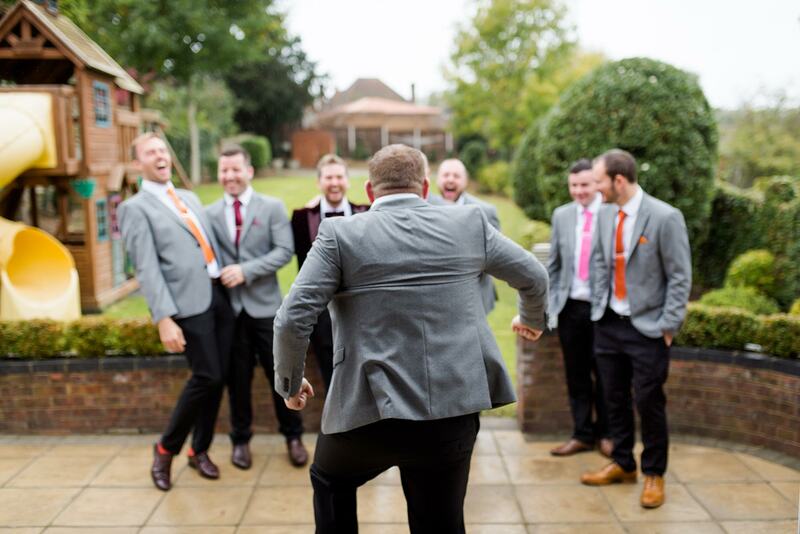 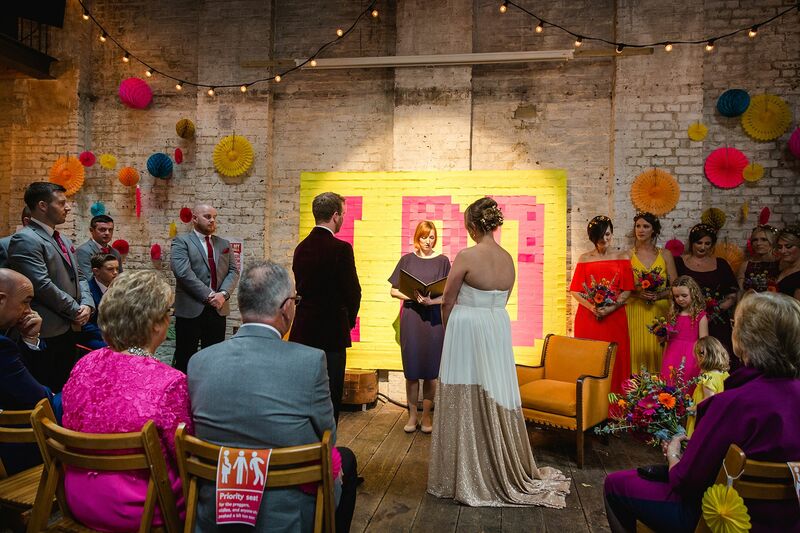 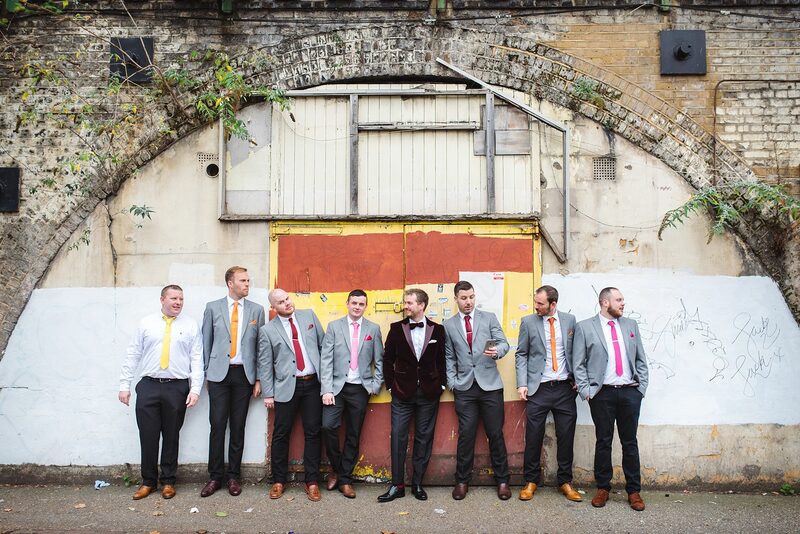 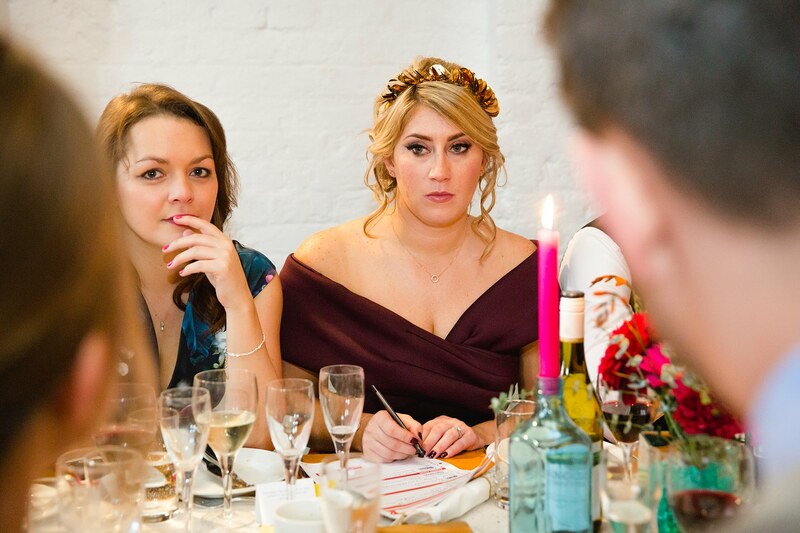 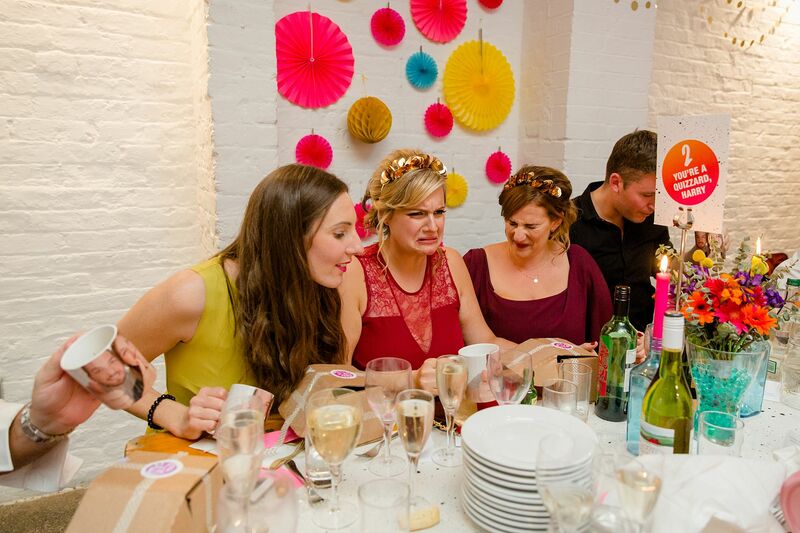 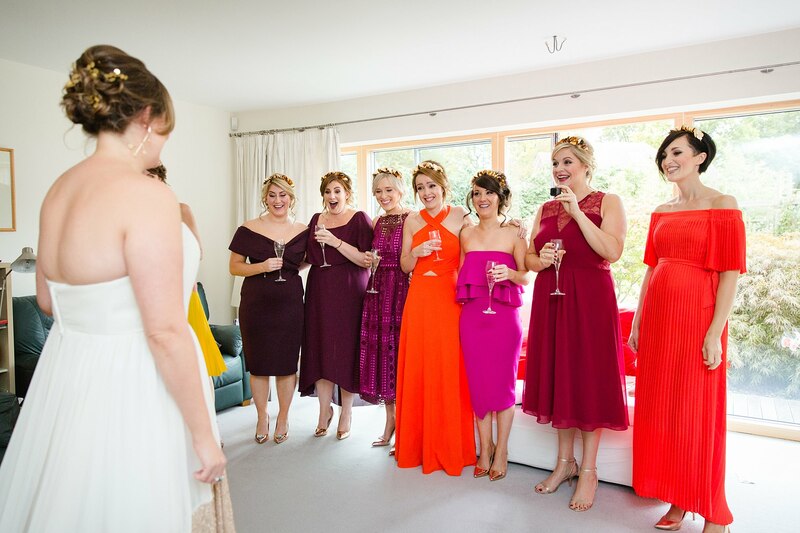 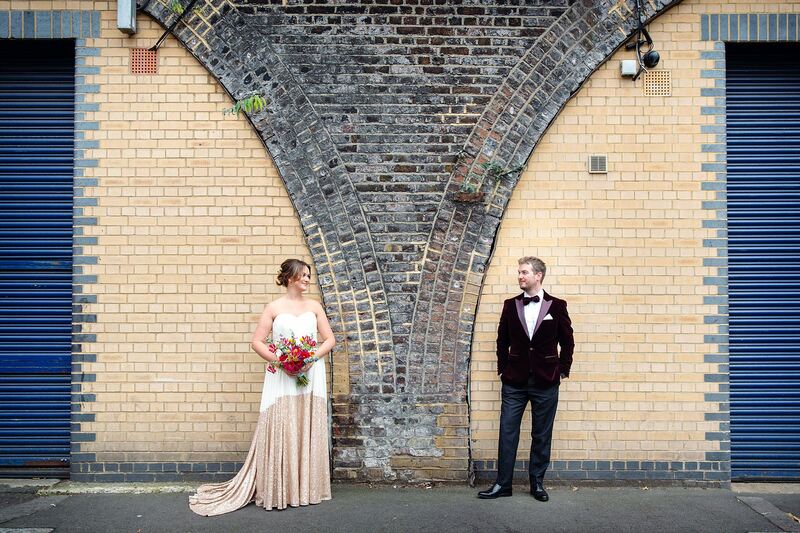 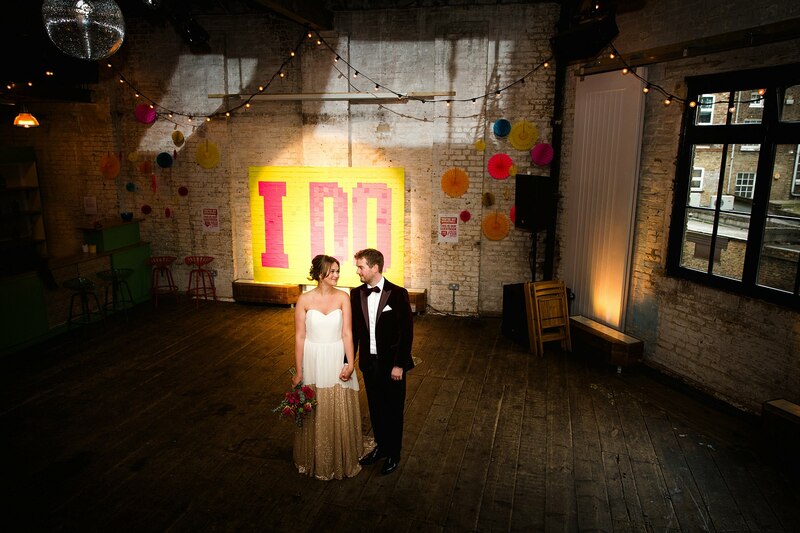 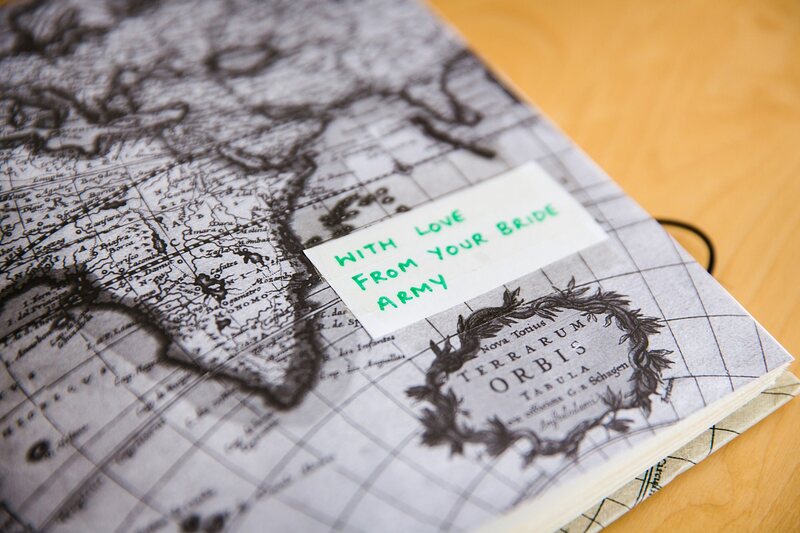 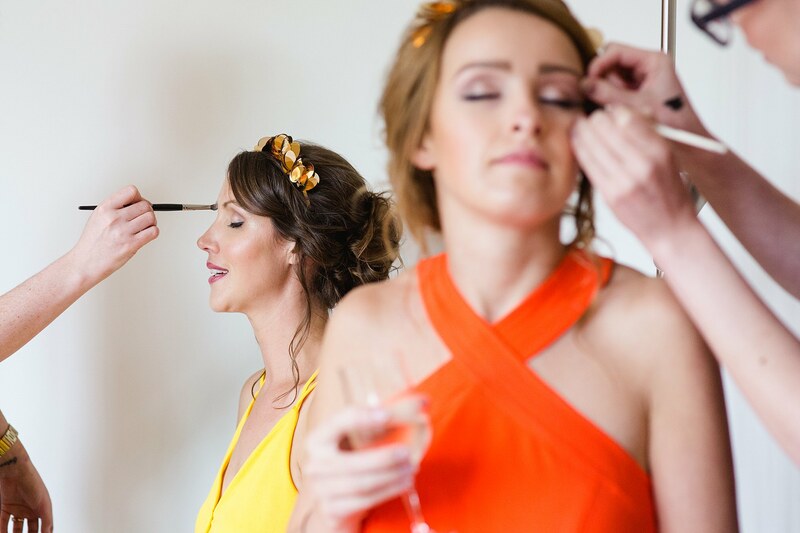 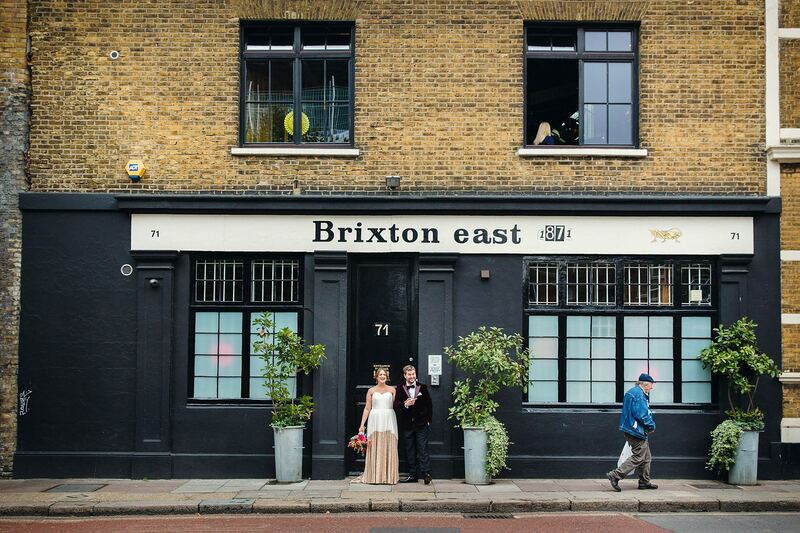 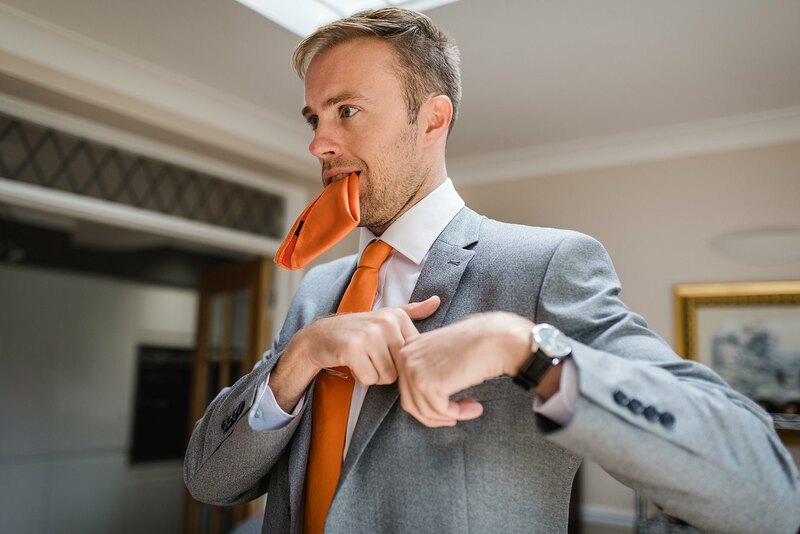 Fun London wedding – Lou and Paul’s epic colourful wedding at Brixton East 1871. 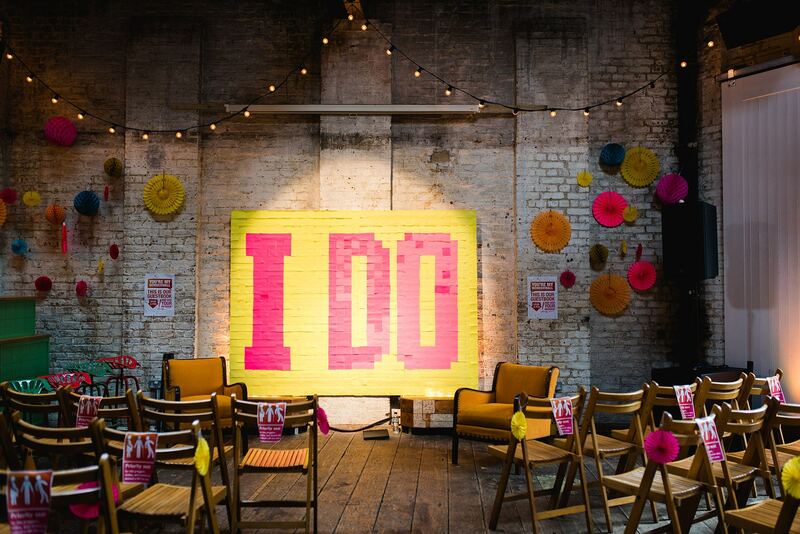 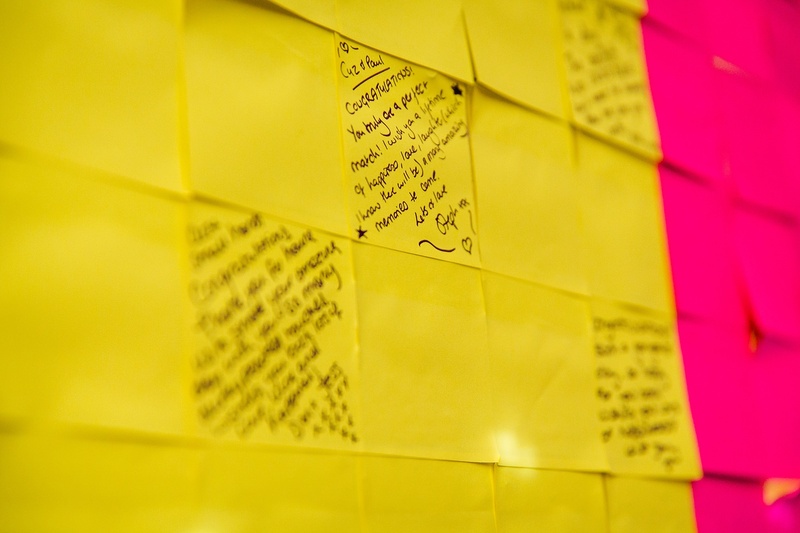 When you walk into a ceremony room and see a wall covered in Post It notes instead of a guest book, you know it’s going to be a superfun wedding! 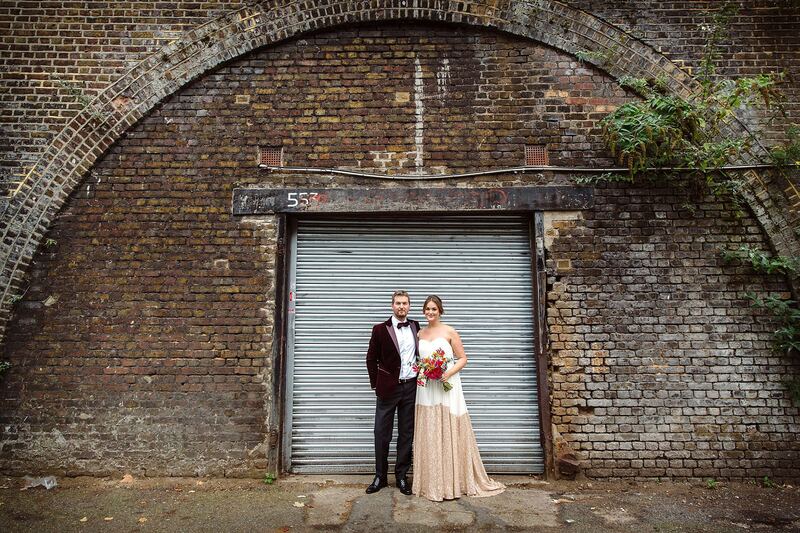 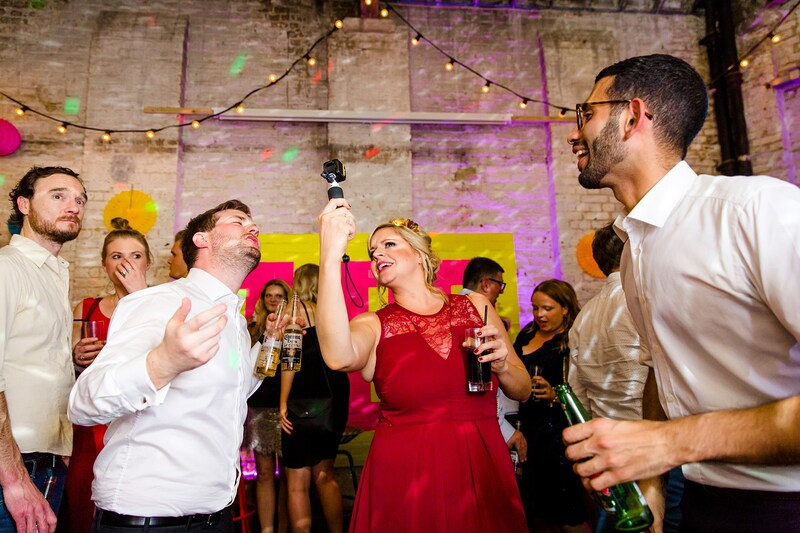 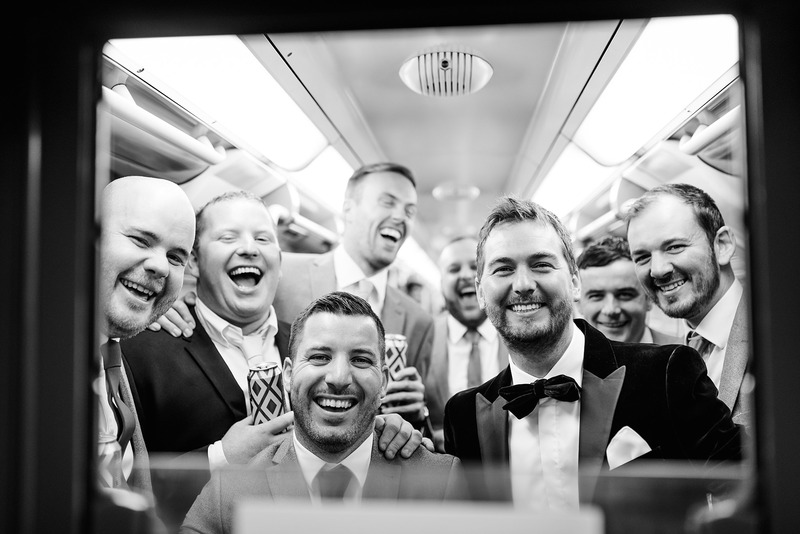 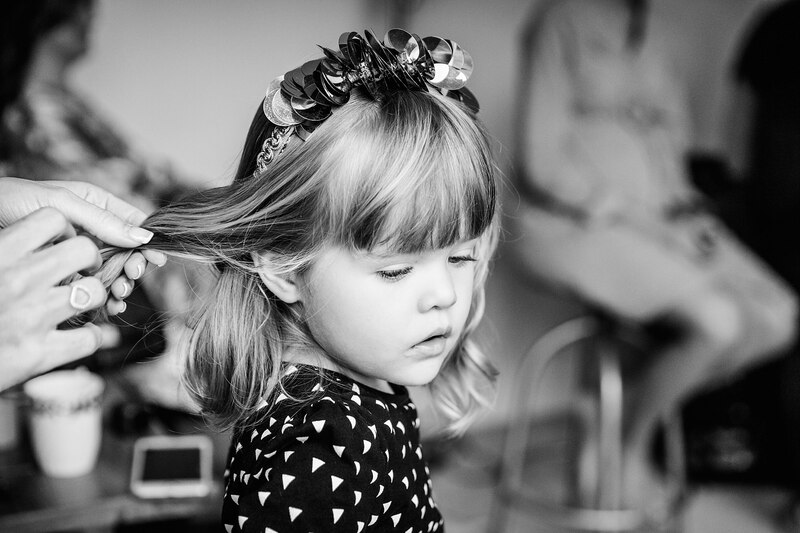 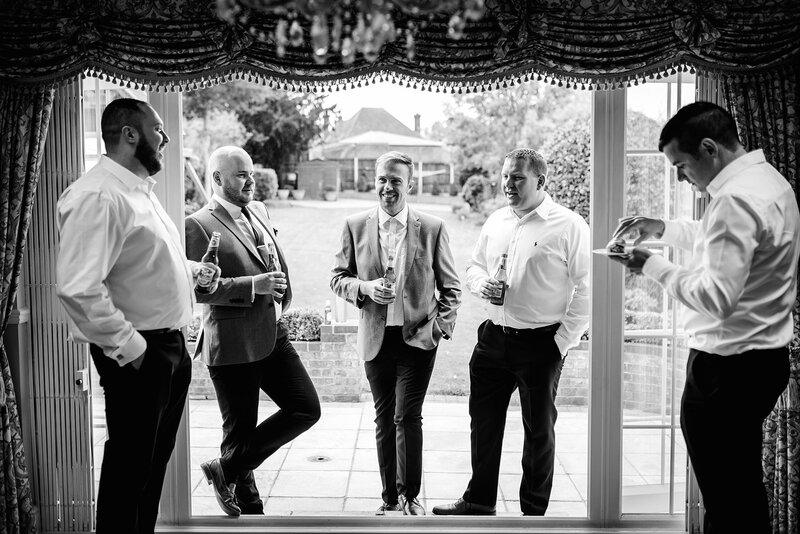 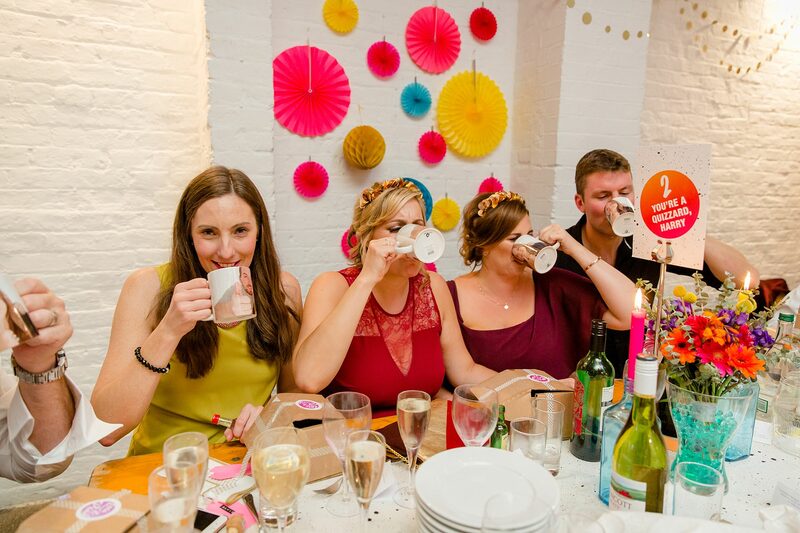 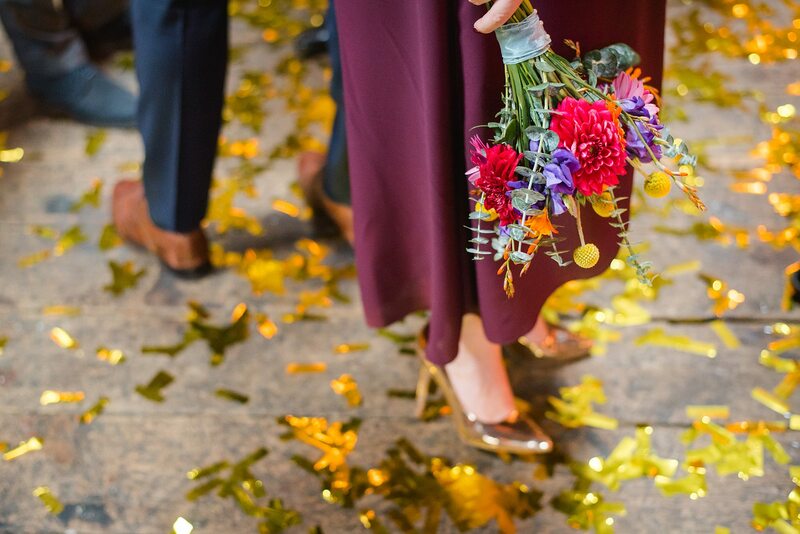 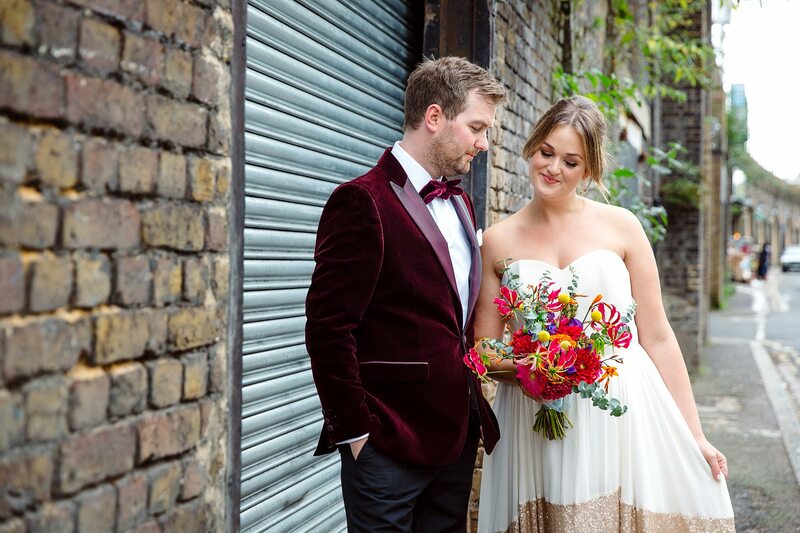 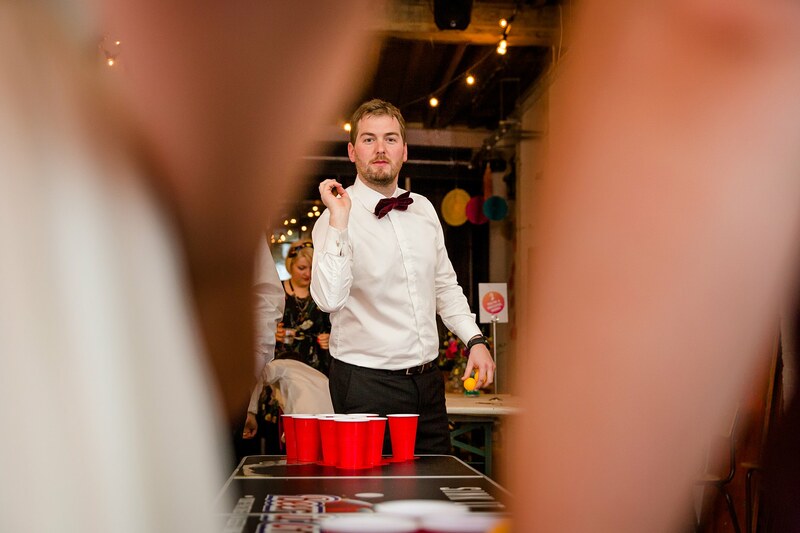 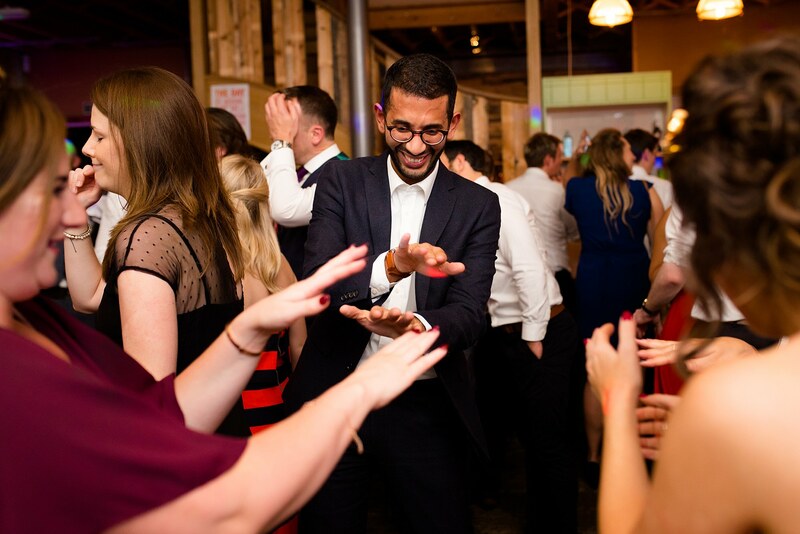 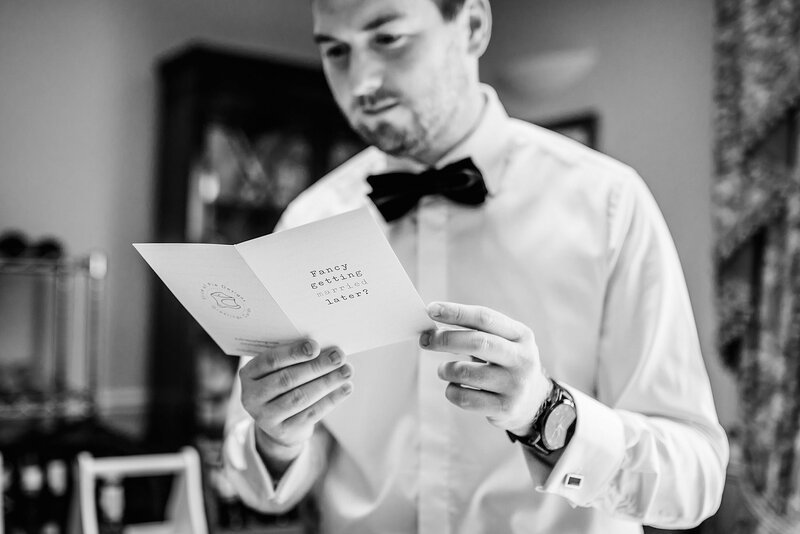 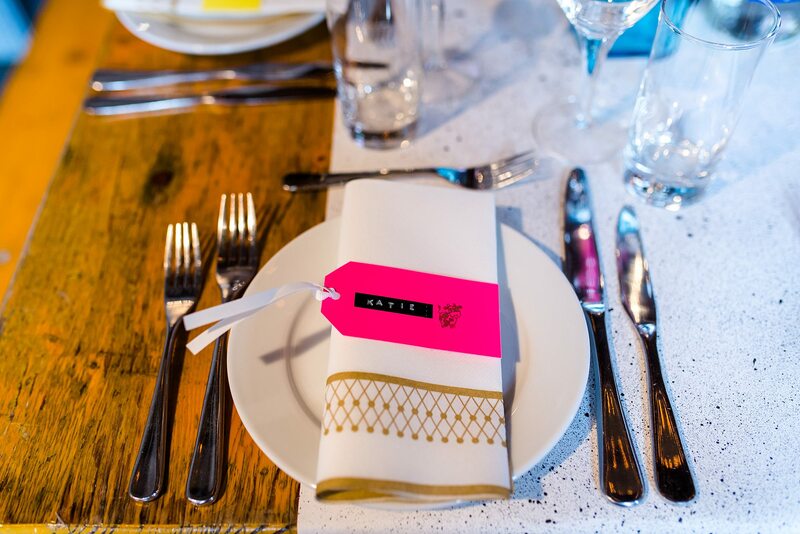 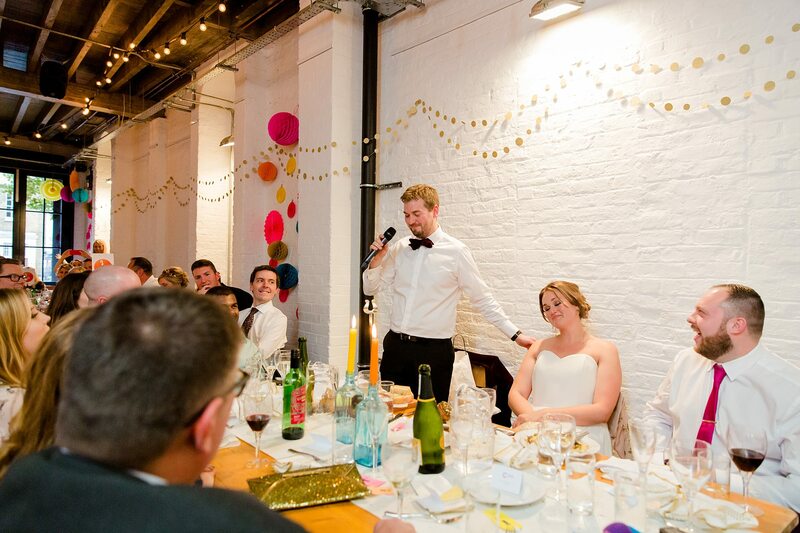 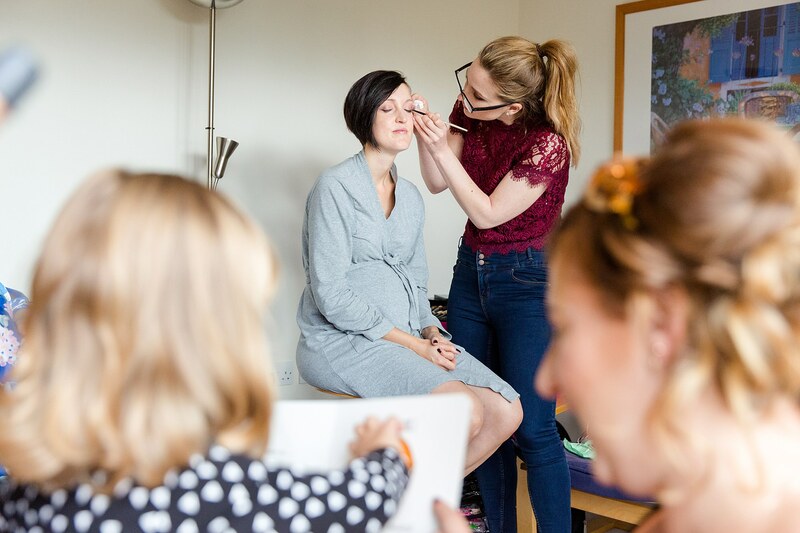 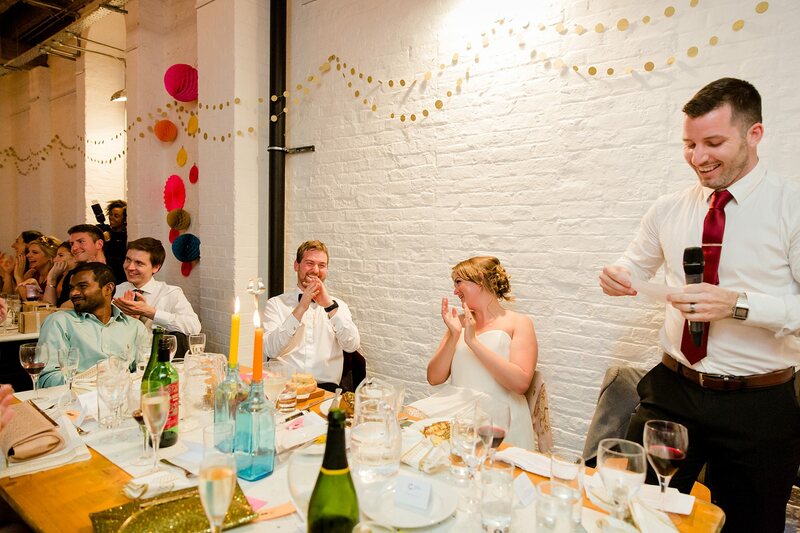 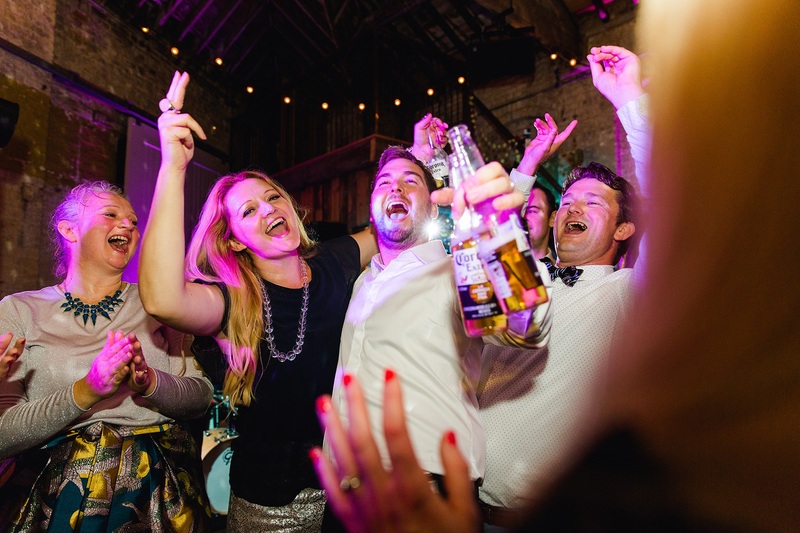 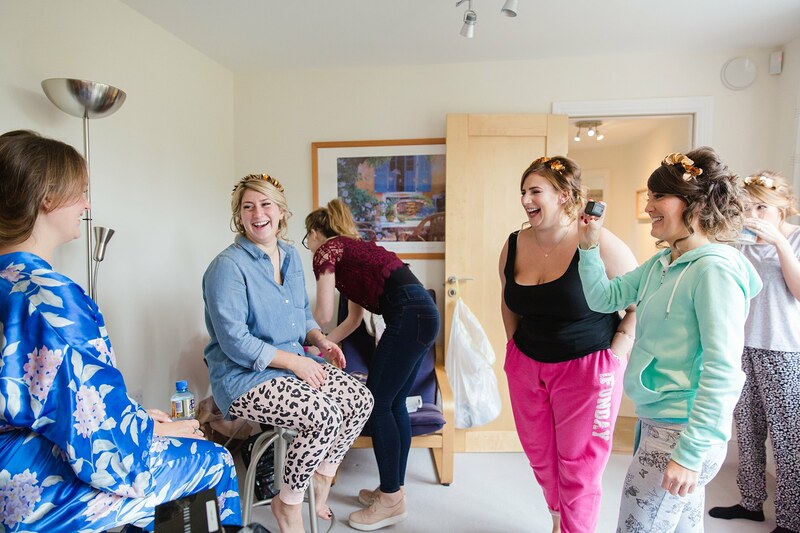 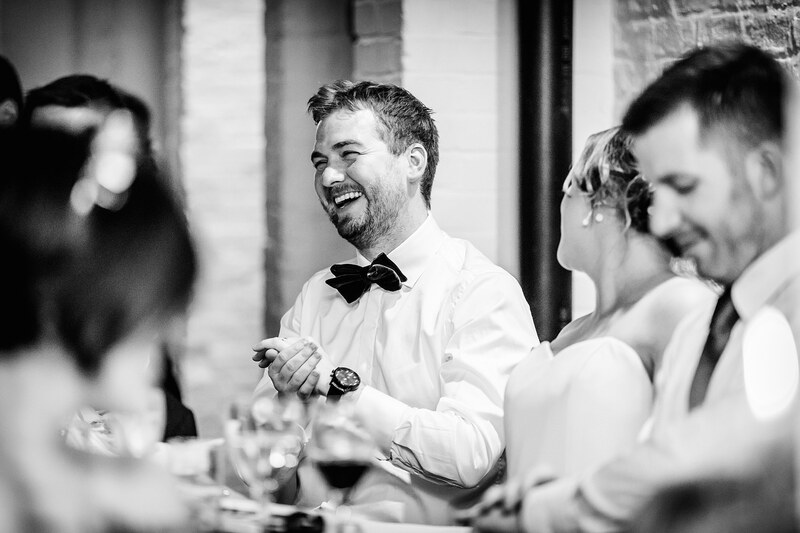 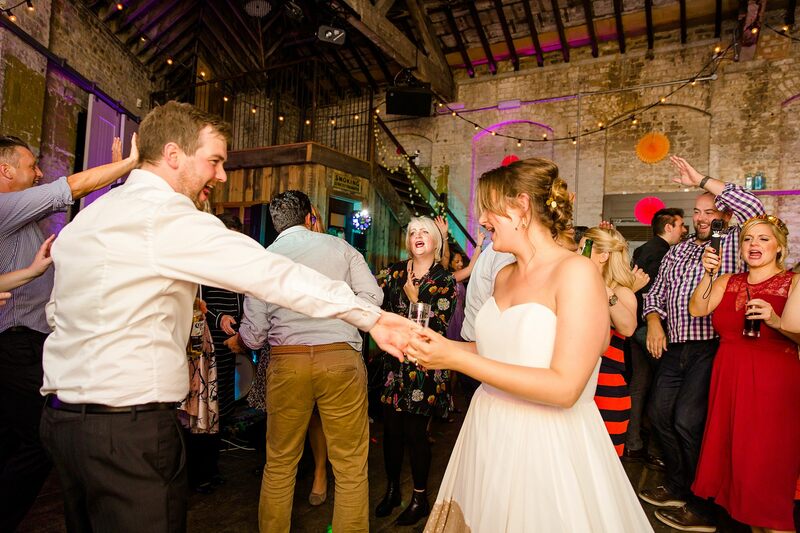 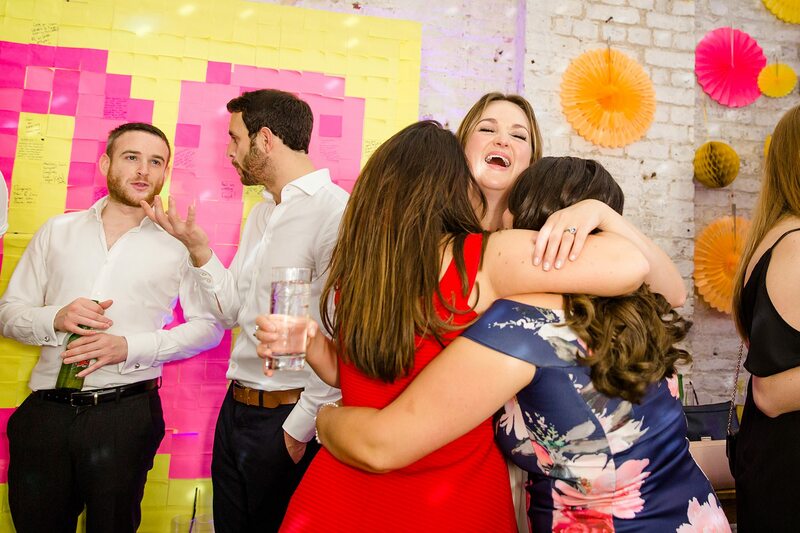 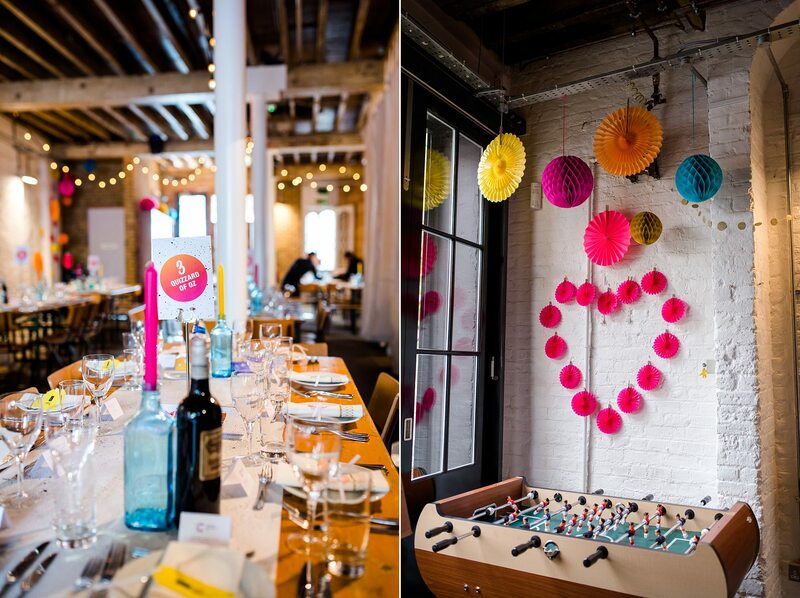 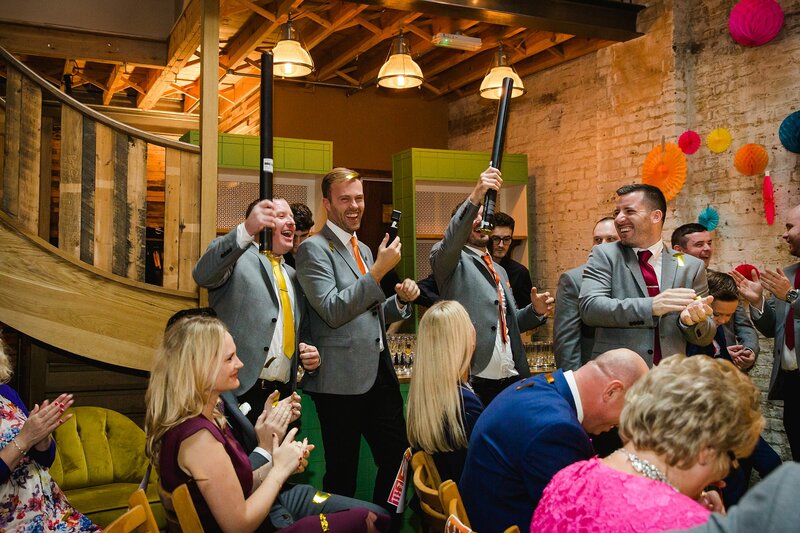 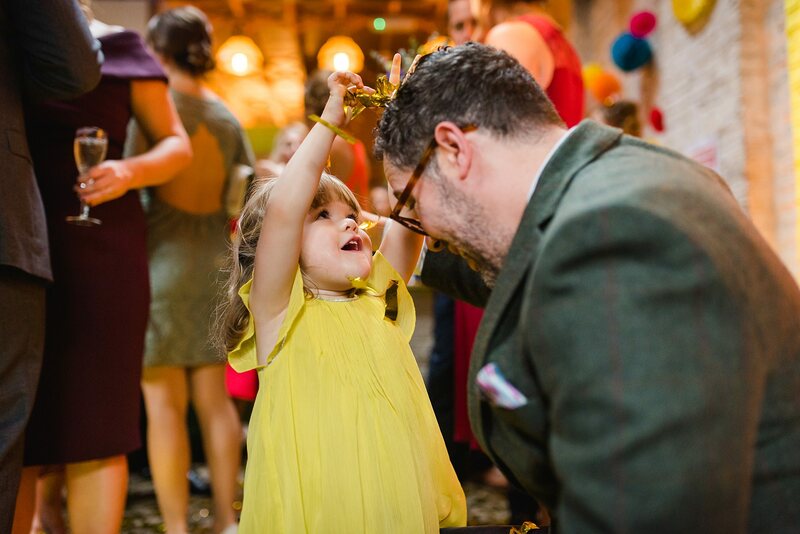 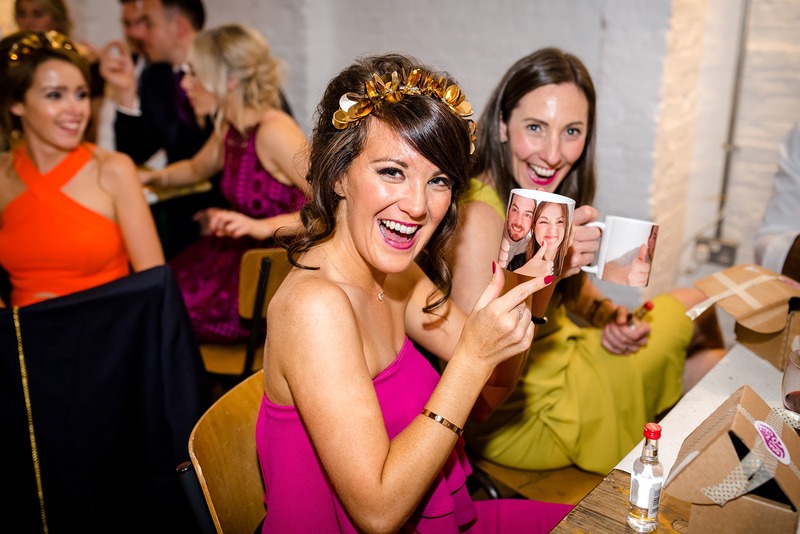 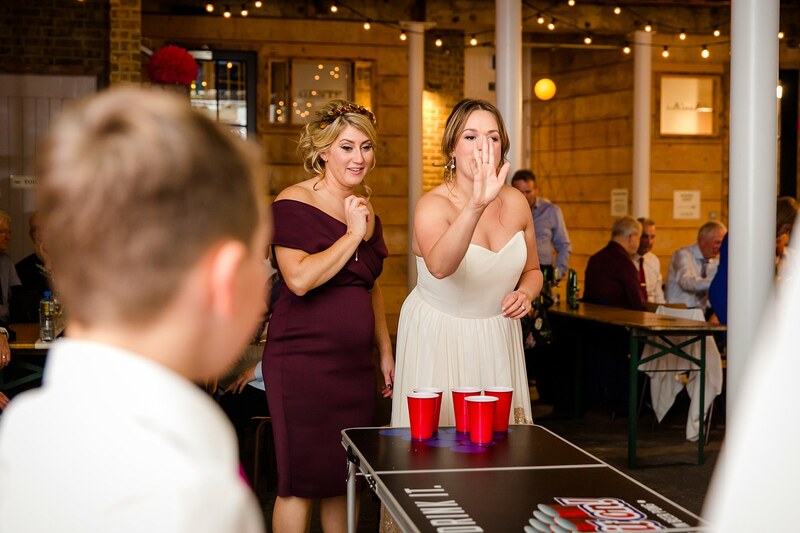 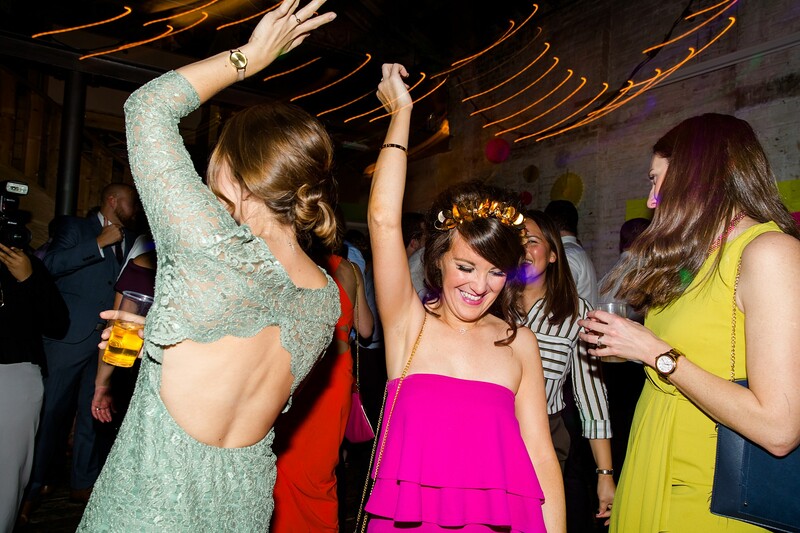 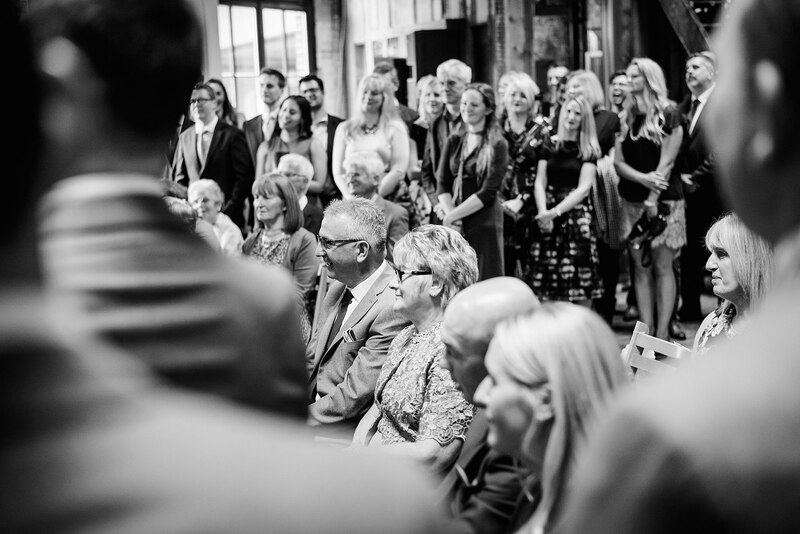 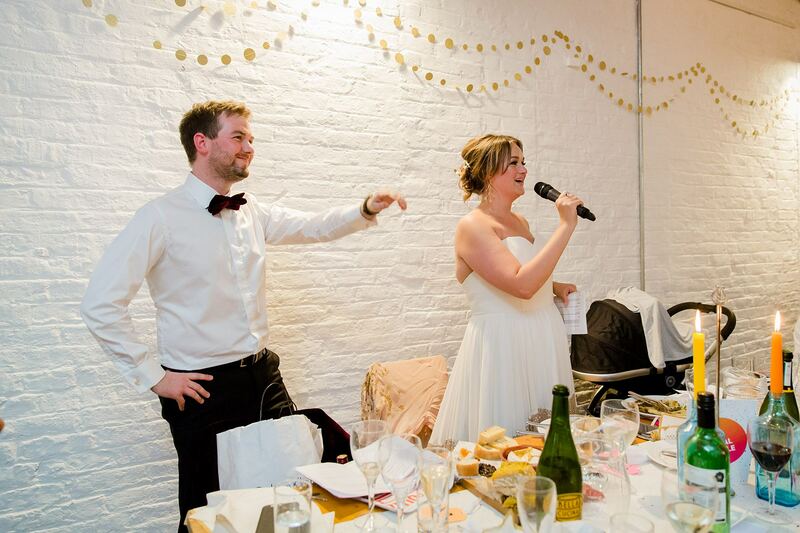 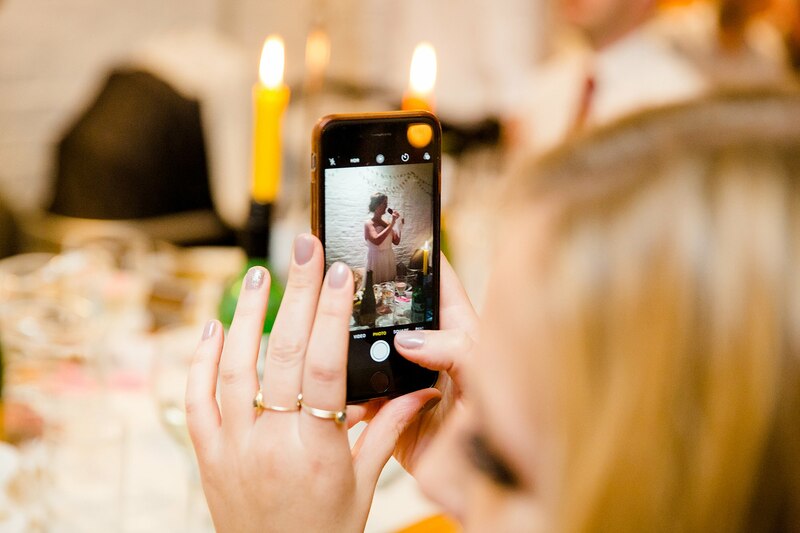 Lou and Paul had a relaxed yet awesome fun London wedding all under one roof in the warehouse style Brixton East venue, with the emphasis on fun, drinking, games, drinking, dancing and more drinking. 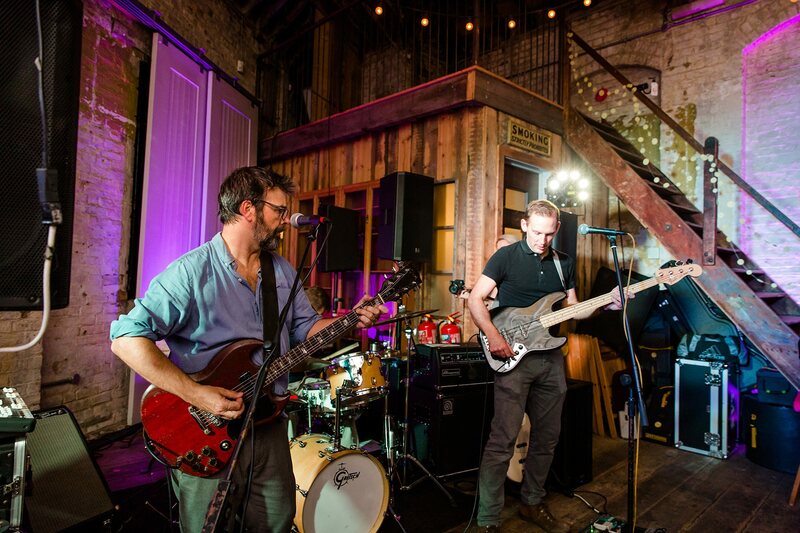 And Garage Hour. 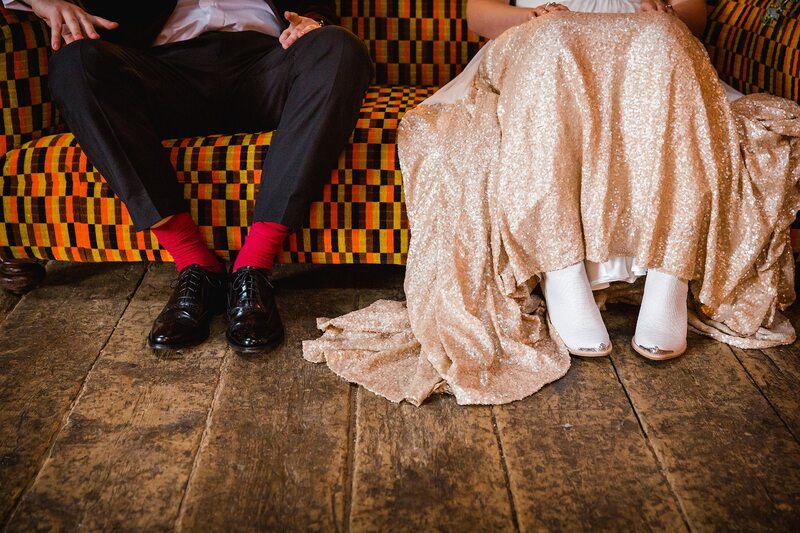 Lou’s bridesmaids all chose their own funky colourful dresses (which just so happen to match their wedding branding) and Paul’s groomsmen went with similar socks. 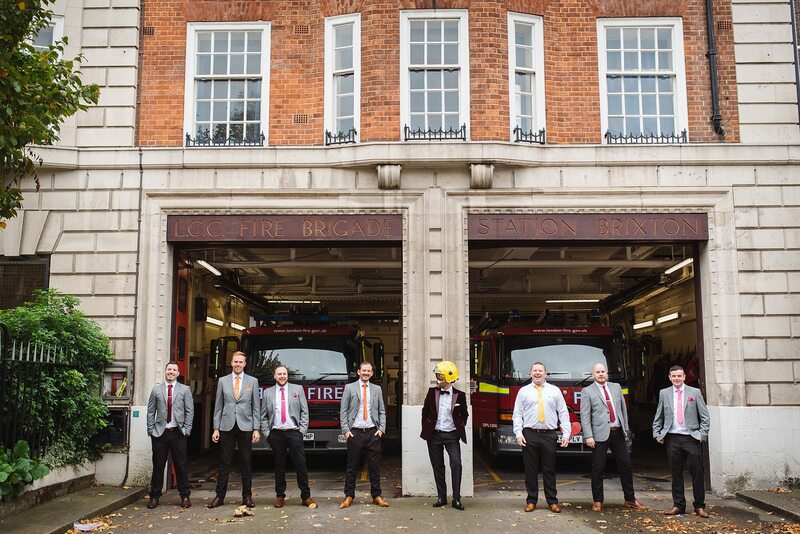 I hung out with Lou and her bridesmaids in the morning, whist my second shooter Ahmani was with the boys, shooting them on the tube and getting some cracking group shots around Brixton with fireman’s helmets and pumpkins. 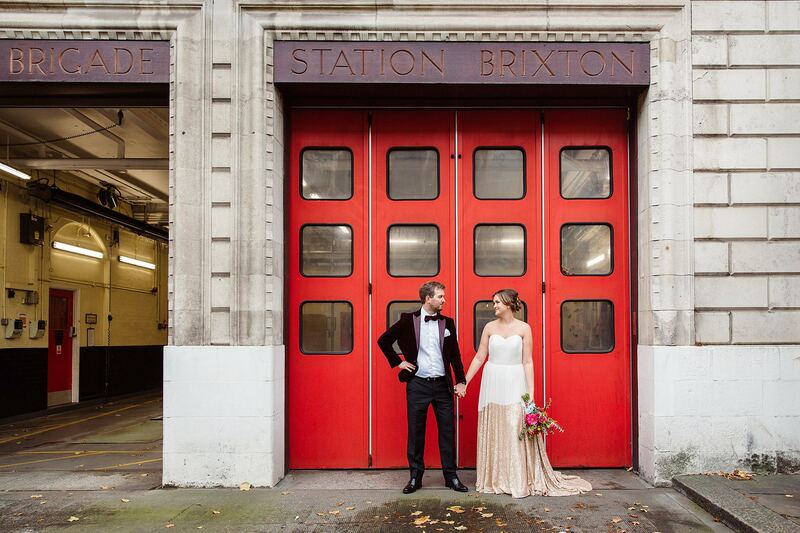 Massive thanks to Brixton Fire Station for that! 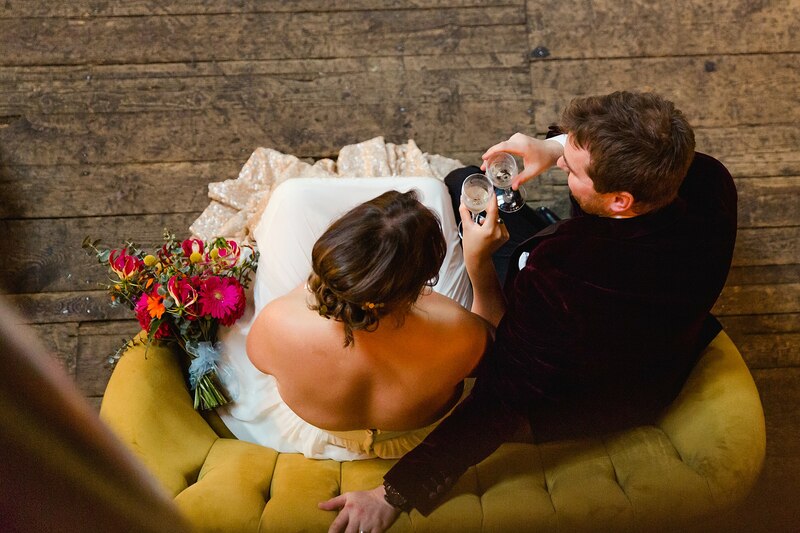 I love the fact that bridesmaids and groomsmen were armed with Go-Pro cameras for the day, so a lot of the wedding was filmed from various guest’s POV. 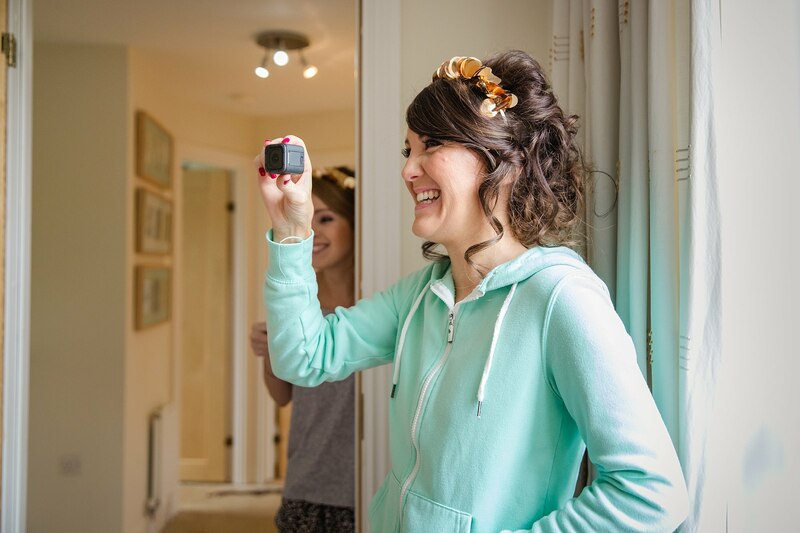 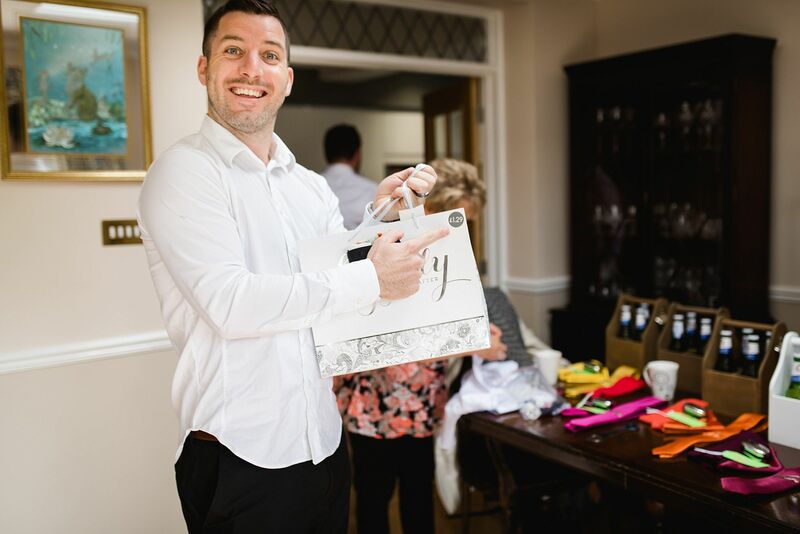 This is a great idea if you fancy some video for your wedding but you don’t have a budget for a full on videographer. 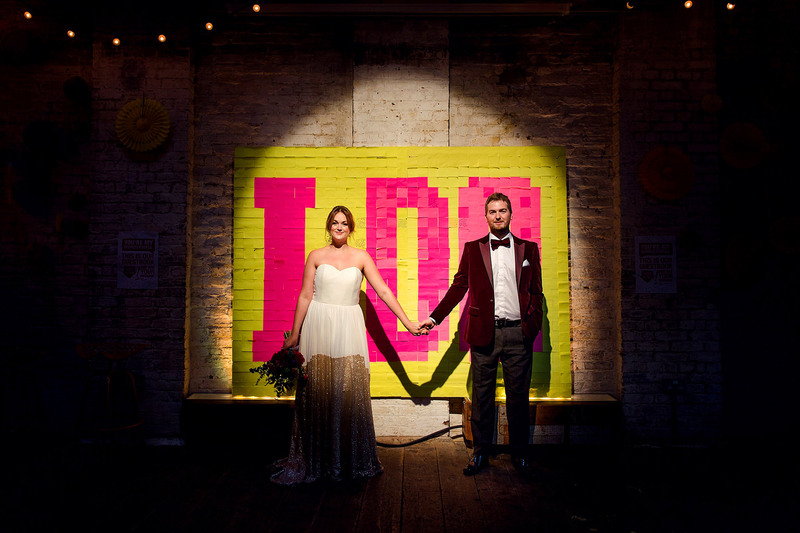 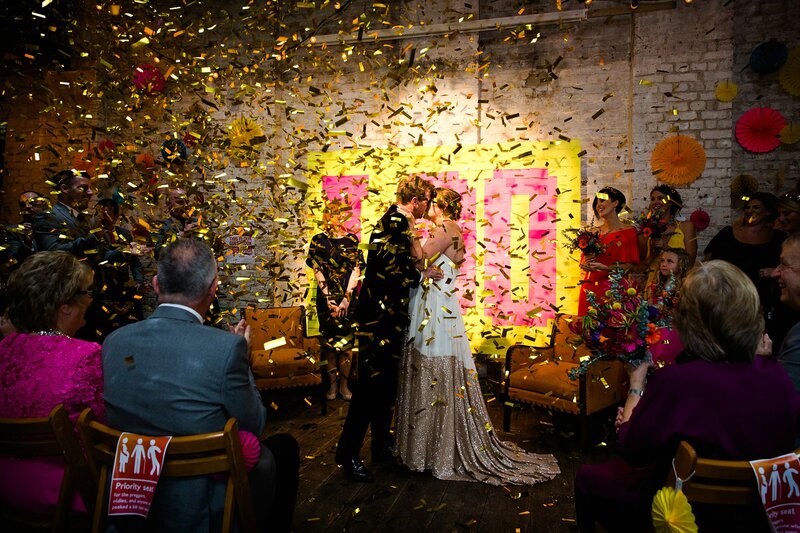 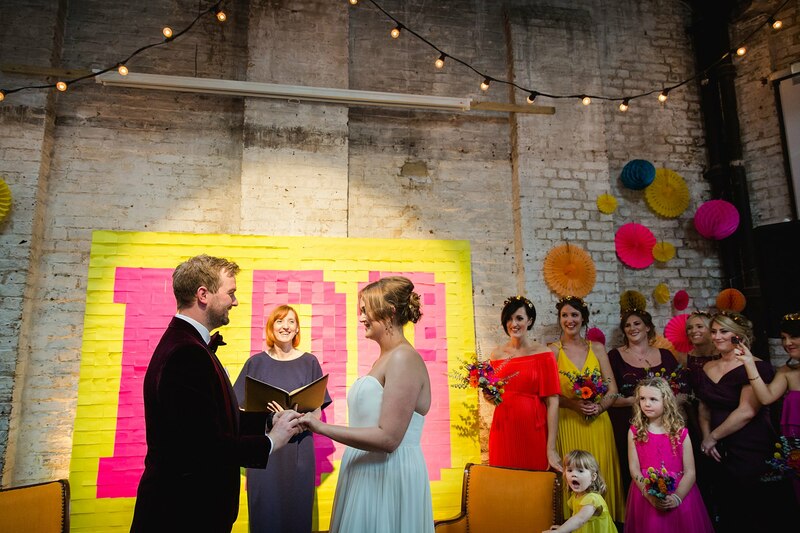 Lou and Paul had a simple celebrant ceremony in front of their amazing Post it note wall, complete with readings about being weird together and jazzy confetti cannons at the end. 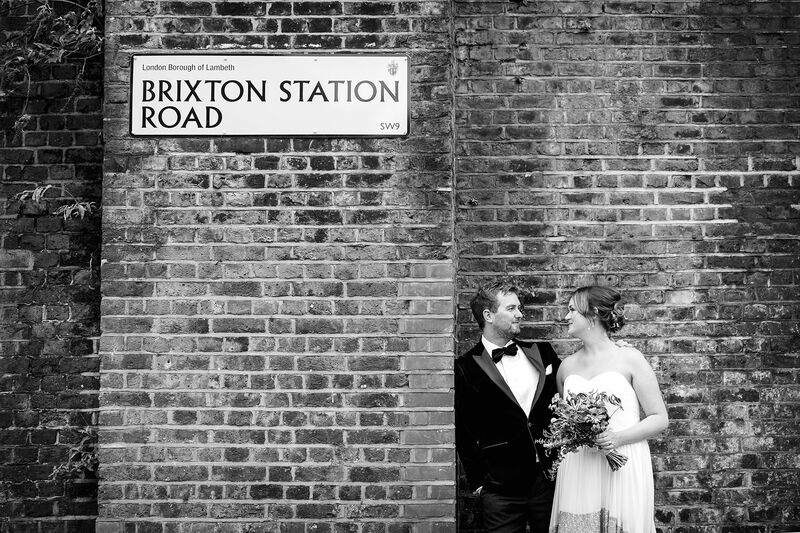 After the ceremony guests hung out with haribo whist I took Lou and Paul on a Brixton wander. 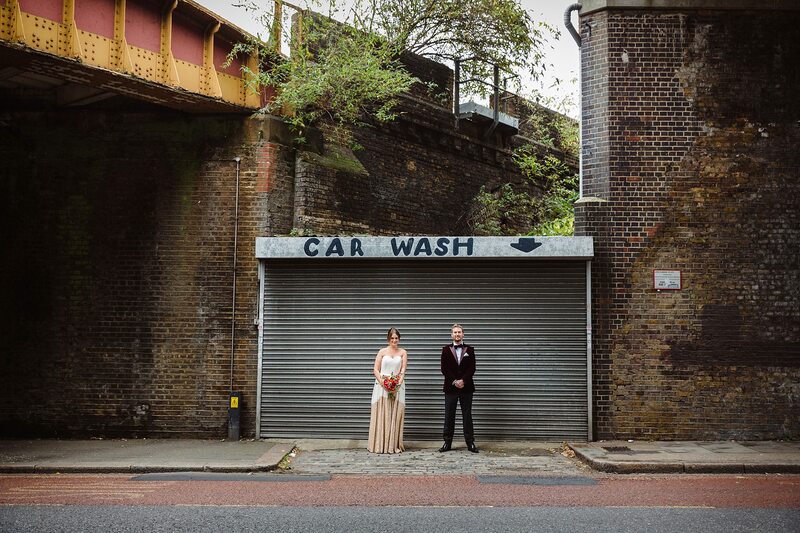 I loved the chance to shoot some proper urban stuff close to home in front of greengrocers, a car wash and some classic railway arches. 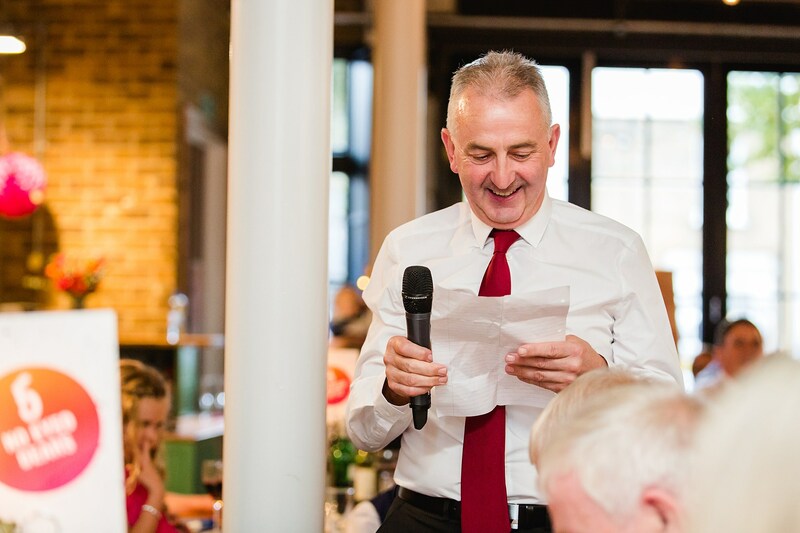 Whist we were out and about, guests played a quiz before having a pie and mash dinner and speeches. 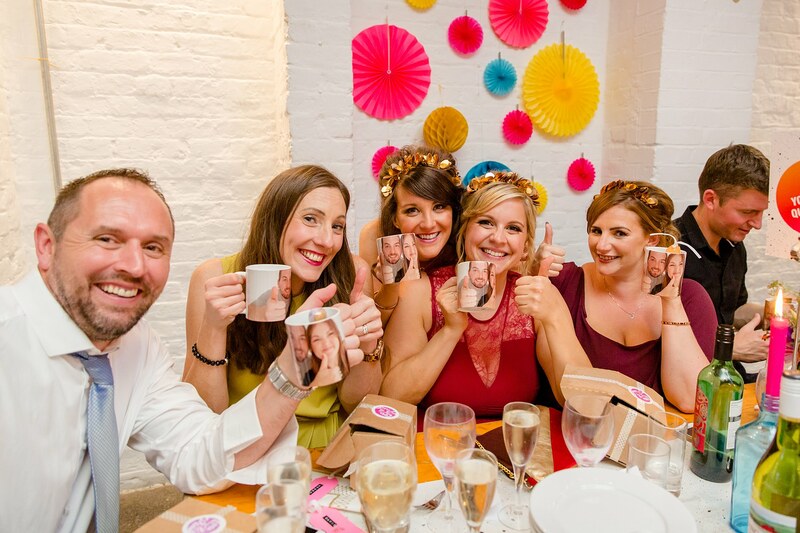 Winners of the quiz were announced by Lou – the prize being mug shots (literally) with Lou and Paul’s faces on them. 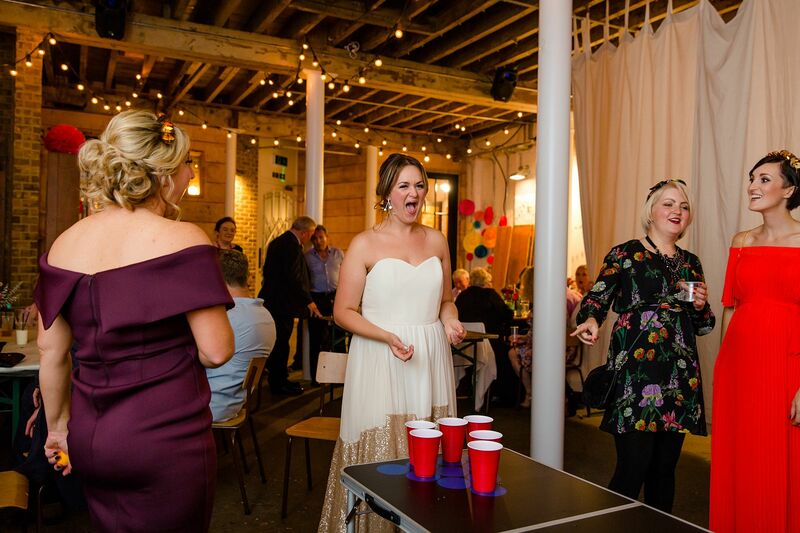 After dinner it was all about the fun times, with cocktails, beer pong, mad dancing and a lot of sing-screaming into Go-Pros! 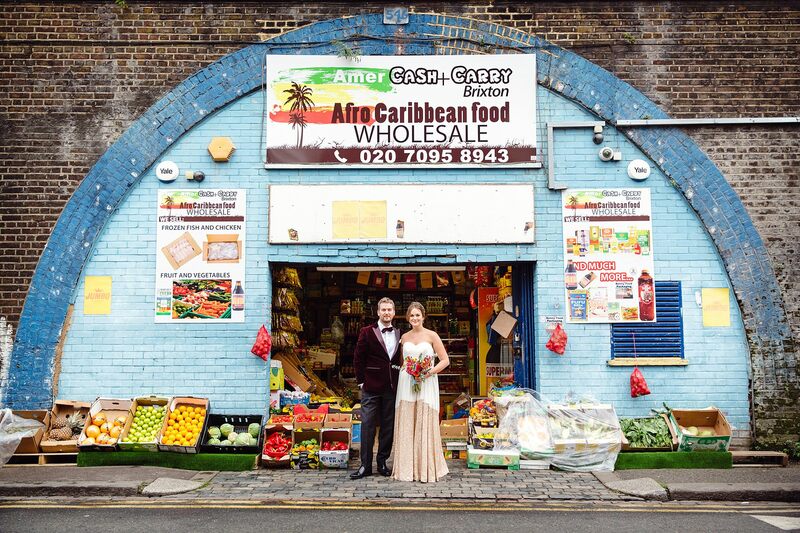 Massive thanks for Ahmani for second shooting with me, and to Lou and Paul for having us both as your colourful and fun London wedding in Brixton. 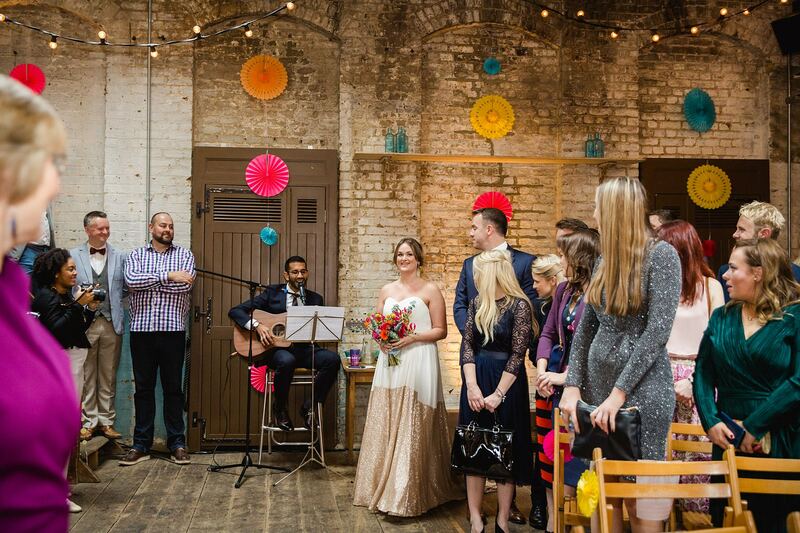 Garage Hour is definitely something I’m considering for my own wedding!